Clowns without Borders | Emilian Snarski M.D. Ph.D.
What is the meaning of our work? What is the force that drives us to do the things we do in life? What stays behind our choices? What meaning is brought to our life by the people we meet? I met Natalia three years ago. It was meeting on the road. I left Sobrado dos Monxes and went into direction of Arzua. Few kilometers away I have met three students from Santader. It was a terrific meeting and we had a good talk. We walked for some kilometers together talking about the life of the doctors and the directions we all take in life. We said goodbye – thinking that we will never meet again. The next meeting happened on the last morning in Finisterra. I was sitting in the bus due to leave the city writing the last sentences from the trip in the notebook. The things I wrote made me think I had to get of that bus to farewell with some friends from the road. Then I met Natalia and Diego again. What a surprise. What a nice adventures they had. I was so happy to hear those stories full of life and energy. We rode the bus to Santiago later that day. I remember playing them this beautiful piece by Olafur Arnalds and band aids on Natalias feet made into the smiles. We went into Santiago together, eat tarta de Santiago in front of the cathedra and said goodbye another last time. 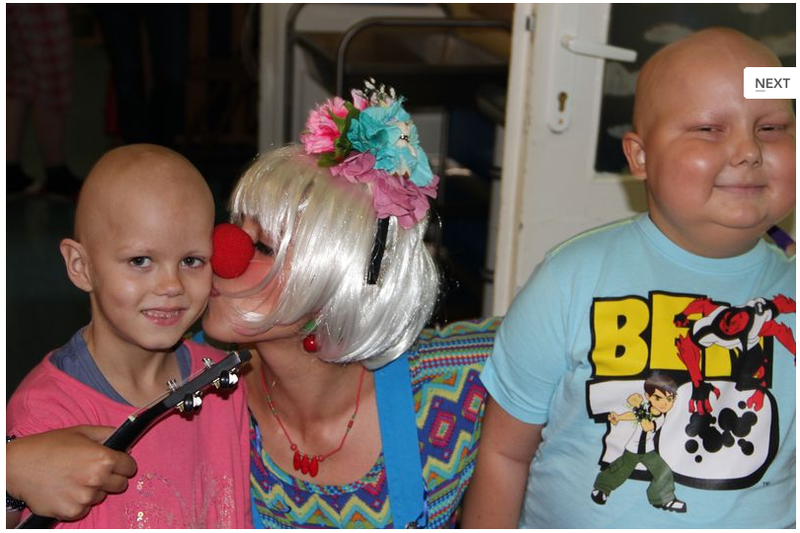 In meantime Natalia got involved in the project of clowning for the kids in hematology and oncology. It is a great project which is set to reduce stress of kids who undergo the treatment for the cancer. But is much more than that. You have to see how it works to understand it. I have never been with Natalia when she is working with the kids – I have only seen her work on video. It is moving. It is very moving. I wish that I will have a chance to see how it works – maybe unpredictable future will grant that wish. I love the idea and I do believe it is something important for the kids and the doctors involved in this project. She has received the price last year for involvement in this project. But the history made a turn and Natalia got possibility to go to Poland. She contacted me and told me that she will be visiting and she wants to do this in Poland. I have contacted her with foundation Spełnione Marzenia. She came and the results of her work can be seen here http://www.spelnionemarzenia.org.pl/wydarzenia/litewska_smile_13/smile.html. Now she travels further making beautiful things in other countries. I was so happy to see her in Poland and see her working here and making her dream come true.